IT (iliotibial) band syndrome: The iliotibial (IT) band is a piece of tough tissue that runs from your hip down to the outer part of your knee. When you overdo activity, it can become inflamed over time. That causes pain on the outer side of the knee. It’s common among runners when going downhill. Meniscal tear: Sometimes, a knee injury can cause cartilage to rip. These rough edges can get stuck in the joint, which causes pain and swelling. Many times, people will have the sensation of “catching” in the joint when they are active. Osgood-Schlatter disease: This condition happens when you’re young, when bones and other parts of the knee are still changing. It can cause a painful bump below the knee, where a tendon from the kneecap connects to the shin. Overdoing exercise, and irritation at a point on the bottom of your knee called the tibial tubercle, often make this area hurt. The ache may come and go over time. It’s especially common in teenage boys and girls. Osteoarthritis: This is the “wear and tear” type of arthritis. It’s a top cause of knee pain after age 50. This condition causes the knee joint to ache or swell when you’re active. Joints affected by osteoarthritis can also be stiff early in the day. Patellar tendinitis: This means you have inflammation in the tendon that connects the kneecap to the shinbone. Tendons are tough bands of tissue that connect muscles to your bones. When you overdo exercise, they can become inflamed and sore. You may also hear it called “jumper’s knee” because repetitive jumping is the most common cause. Patellofemoral pain syndrome: Muscle imbalance, tightness, and alignment problems of the legs usually cause this condition. It causes knee pain and occasional “buckling,” meaning your knee suddenly can’t bear your weight. It’s not due to an injury. It’s more common for women than for men. If you have these symptoms, see your doctor. He will check your knee. You may also need X-rays or an MRI to see more detail of the joint. Rest your knee. Take a few days off from intense activity. Ice it to curb pain and swelling. Do it for 15 to 20 minutes every 3 to 4 hours. Keep doing it for 2 to 3 days or until the pain is gone. Compress your knee. Use an elastic bandage, straps, or sleeves to wrap the joint. It will keep down swelling or add support. Elevate your knee with a pillow under your heel when you’re sitting or lying down to cut down on swelling. Take anti-inflammatory medications. Nonsteroidal anti-inflammatory drugs (NSAIDs) such as ibuprofen or naproxen will help with pain and swelling. Follow the instructions on the label. These drugs can have side effects, so you should only use them now and then unless your doctor says otherwise. Practice stretching and strengthening exercises if your doctor recommends them. You may want to do physical therapy, too. Some people with knee pain need more help. For instance, if you have bursitis, your doctor may need to draw out extra fluid from the bursa in your knee. If you have arthritis, you may need an occasional corticosteroid shot to settle down inflammation. And if you have a torn ligament or certain knee injuries, you may need surgery. The recovery time depends on your injury. Also, some people naturally heal faster than others. Your injured knee feels as strong as the other knee. If you start to use your knee before it’s healed, it could get injured again. Although you can’t prevent all injuries, you can take these steps to make them less likely. Stop exercising if you feel pain in your knee. If you want to make your workout more intense, always do it gradually. Stretch your legs before and after physical activity. Use kneepads to prevent bursitis, especially if you have to kneel a lot. Wear shoes that fit well and offer enough support. Keep your thigh muscles strong with regular stretching and strengthening. If you’re overweight, work to drop some pounds so there’s less stress on all of your joints, including your knees. Losing weight and keeping it off can seem like an almost impossible feat. Things like the “rebound effect” and stress or changes in our daily routine can have serious consequences when it comes to keeping weight off. Losing weight healthily should be our main goal. Maintaining our ideal weight, a daily task. Now, how do you go about it? Genetics and even not having the time to cook healthy meals are often our worst enemies when it comes to losing weight. Today we’d like to show you the top five fruits for weight loss. We’re sure they’ll be able to help you. Just as important is knowing how to eat them. Lemon juice is rich in vitamin C. This important nutrient is good for your liver’s health. Good liver health means fat metabolism is at its peak. As a bonus, your body will digest food better and be better able to absorb nutrients. Lemon helps detox the body, flushing toxins out through the urine. This citrus fruit is filling and fights constipation. 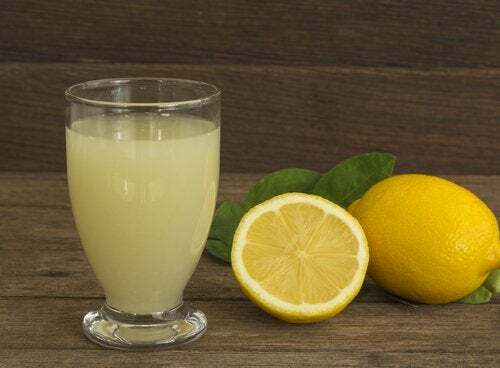 Start your day with a glass of warm water and the juice of one lemon. Sprinkle a little lemon juice on your salads. When you first think of strawberries, you probably imagine a decadent dessert, loaded with calories. Even though this fruit is usually associated with high-calorie desserts and smoothies. Strawberries contain very little sugar, but are loaded with vitamins. We can’t forget that strawberries are diuretics and contain powerful antioxidants. They’re full of fiber to fight constipation. Another thing to keep in mind about strawberries is that they possess anti-inflammatory properties. Strawberry water: combine a liter of water with the juice of 10 strawberries and a little lemon juice. Strawberry salad with spinach and walnuts, great for healthy weight loss. All apples are beneficial, but green apples are rich in phenolic acid and flavonoids. They’re excellent for regulating blood sugar levels. Green apples can help you control your LDL or bad cholesterol. They help accelerate the metabolism. 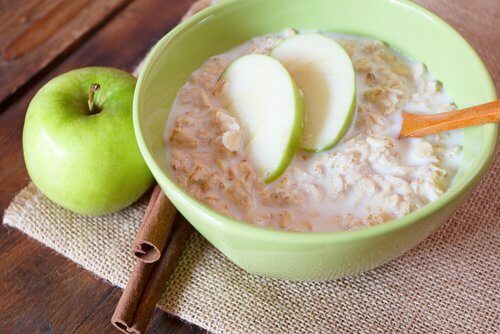 While boosting your metabolism, green apples work on the fat itself, making it easier to burn off. Eat them raw in the early hours of the day with the peel, if possible. Try a green apple and oatmeal smoothie. Blueberries are an endless source of nutrition without a lot of calories. Eating just 10-20 blueberries per day is enough to provide you with high levels of vitamin C, potassium and antioxidants. Blueberries contain insoluble fiber, ideal for improving digestion. These berries are also rich in tannins, which work as powerful natural astringents. Another thing to keep in mind about these tiny fruits is that you can eat as many as you like without worrying about gaining weight.They’re filling and extremely versatile in the kitchen. At breakfast, try combing them with other types of fruit. Use them in natural smoothies. Toss a few in your salads. Pomegranates contain powerful antioxidants. These have incredible benefits for the body: improving blood flow to the heart and helping keep arteries free of fatty deposits. Even though pomegranates are a fall season fruit, they’re worth waiting for to take advantage of their beneficial properties. Eating pomegranates prevents fat from accumulating in the abdominal area. Pomegranates are rich in fiber, anti-inflammatory and can help eliminate bad cholesterol or LDL. 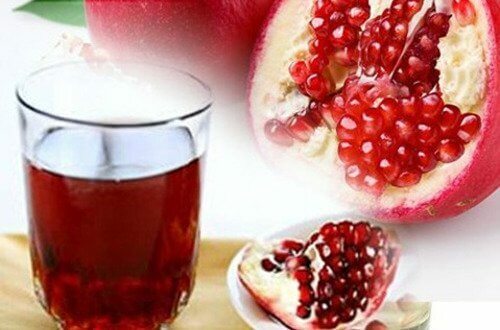 You can also drink pomegranate juice, if available, with breakfast. In conclusion: don’t hesitate to take advantage of the benefits of these fruits for your health and figure.